ANGELO FICHERA TTN. Sophomore Robert Eells’ off-campus house was the scene of a shooting on Sept. 5. After being shot Eells, who had a permit to carry, shot back at a young would-be robber. Students discuss ways they choose to protect themselves while off Main Campus. It was only a week into the school year when gunfire erupted between a student and a local youth near Main Campus. But while the Sept. 5 incident left the two hospitalized, it also caused some to question the presence of weapons in North Philadelphia and, more specifically, in the posession of students. Robert Eells was with a friend on his front stoop in the early hours of Labor Day when a 15-year-old male came up and demanded money. When Eells’ refused, the youth took out a gun and shot him in the stomach, reports state. The juvenile tried to flee, however, Eells, who has a permit to carry a concealed weapon, drew his own gun and returned fire, shooting the youth in the back. Both Eells and the assailant were hospitalized and both are expected to make full recoveries. The event draws attention to students’ interest in protecting themselves by carrying weapons. In addition to firearms, some students carry knives, bats and pepper spray for self protection. According to Pennsylvania law, one must be 21 to qualify for a concealed carry permit. Applicants must visit a sheriff’s office and perform a background check before being issued a permit. Junior history major Alex, who spoke on the condition that his last name would not be printed, went through the procedure three months ago when he turned 21 and claimed that it was relatively simple. The more difficult aspect for him was deciding to own a weapon and then pursuing that responsibly, he said. Alex chose to apply for a permit and own a weapon for self-protection within his home. He cautions against carrying a firearm in one’s possession because it may attract unwanted attention. Temple’s policy dictates that even those with a permit to carry cannot have a firearm anywhere on campus. In February 2010, Temple Student Government voted unanimously to adopt a resolution relating to gun violence. The resolution urged the Pennsylvania General Assembly to support state legislation intended to reduce illegal handgun trafficking and accessibility to illegal handguns in Pennsylvania. “We had met with CeaseFire[PA] in the fall of 2009, we had been talking a lot about the violence around campus that was a problem as it still is today,” Temple Student Government Study Body President Colin Saltry said. 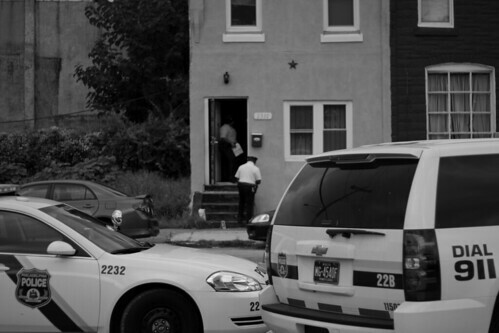 CeaseFirePA is a Philadelphia-based organization committed to reducing gun violence as well as illegal gun trafficking. Still, students choose to carry other weapons in order to protect themselves while off campus. Freshman entrepreneurship major Sam Gordon chooses to carry a knife while off campus. Despite studies showing that pepper spray blowback can be as harmful to the person using it as to their attacker, senior strategic and organizational communications major Katie Morris still chooses to carry it. “I’ve always had pepper spray, and if I’m by myself it’s a reassurance that I have self-protection,” Morris said. Neither Gordon nor Morris have been the victim of a violent crime. Junior economics major Chad Dunkelberger said he has always carried a knife, but with the intention of using it for utilitarian tasks. Last year, Dunkelberger was in his bedroom in an off-campus house when he found himself looking down the barrel of a gun. An armed man and his accomplice had forced their way into the house and made Dunkelberger and his roommates lie on the floor while they proceeded to rob them of their laptops, televisions, cell phones and wallets. Though he professes an interest in one day owning a handgun, the only action the crime prompted in him was to move away from the Temple neighborhood, he said. Acknowledging the possibility of increased student firearm ownership, Dunkelberger expressed some concern but generally supported students protecting themselves. The Pennsylvania Firearms Owners Association is a group focused on educating the public about firearm safety and laws. PFOA Media Relations Director Christie Caywood said she got involved with the organization after experiencing crime on her college campus. Caywood advocates gun ownership as an option for students, but emphasizes the necessity of pursuing firearm ownership through proper legal avenues. Senior sociology and political science major Beth Cozzolino, president of the Temple Democratic Socialists, a campus group that also advocates gun control, objects to students owning firearms in general. Alex agrees that gun control is a good idea but argues that it is impractical. Am I the only one who finds it odd the paper didn’t seek out the College Republicans to comment on gun issues when they reached out to the Socialists? I AM GRATEFUL STUDENT BODY IS DISCUSSING SELF DEFENSE METHODS WHILE OFF CAMPUS; BUT CONSIDER THIS IF YOU WILL; PREVENTATIVE MEASURES ARE A MUST!! YOU CANNOT HAVE ONE WITHOUT THE OTHER!! CRIME PREVENTION IS KEY!! PREVENTION IS A WIN WIN CHOICE( EVERY TIME )….. SPREAD THE WORD! Temple University policy is not law. It is perfectly legal to carry a firearm on campus. You may get asked to leave and/or expelled, but it is not illegal. Just keep it concealed and keep your mouth shut and nothing will come of it. More guns isn’t going to solve gun violence. Losing your wallet is not worth getting shot, and you can prevent crime without owning a gun. Most preventative tactics against violence and crime involve being alert and making good decisions. This obviously doesn’t work all the time, but personally, I don’t think more guns in North Philadelphia is going to make anything better. ghetto thugs will shoot you anyway. Elizabeth – more guns don’t solve violence? Hmmm, next time, don’t call the cops – because they bring more guns into the situation. Uh oh. Sometimes you may be the most alert and think you made all the right decisions and still some criminal accosts you and doesn’t want you reporting him/her. This is where the well-practiced, peaceable armed citizen will effectively deal with the problem at hand. In summary – one dead thug. And thanks to CeaseFirePA for making our statements for us at Students for Concealed Carry – CCWing is a huge responsibility and it is YOUR duty to train to exercise your rights properly so they don’t get taken away from you! Let’s get some legislation together to help make training and accessories to training more affordable to peaceable citizens. Let’s start by having the local police/Temple police pair up with a training company to offer CCW classes/continuing education-style CCW classes. I graduated from Temple in ’97. I legally carried the entire time I was there. I disagree with the “compliance” strategy proffered by the University and others. Look what happened last year at to the Johns Hopkins student who was stabbed for no reason after handing over his wallet. There’s a list of these type of incidents.. years ago at UPenn….the Russian grad student who was shot and killed….or the Temple student who was killed in the 90’s (hit over the head with a pipe while at the ATM). Asking one not to defend him or herself is ridiculous. You simply cannot make that determination for someone else. As a side note…one major stereotype that irritates me is that all pro 2nd Amendment supporters are right-wing conservatives or Republicans. I’m a pro 2nd Amendment Dem and I know lots of others like me. Frankly I feel like were a silent majority. If more liberals and liberal politicians spoke up/out positively about the right to own firearms and the right to defend one’s self. There’d be a Democratic landslide….universal, “single payer”, healthcare would’ve passed, not the monstrosity being implemented now (i.e. Dems would’ve had more votes). Other liberal initiatives would be progressing such as funding for education, clean energy, etc. This anti-gun agenda so many liberals have really hurts them with more “middle of the road” liberal and conservatives. I believe that one of the reasons President Obama was elected so easily was due to his position on gun control….he said he’d make no moves to increase gun control and despite right-wing propaganda he hasn’t. Anywho…this has devolved into a rant. My apologies. Good for Robert. Get better soon. As Shakespeare might have said to his attacker “turn about is fair play”.